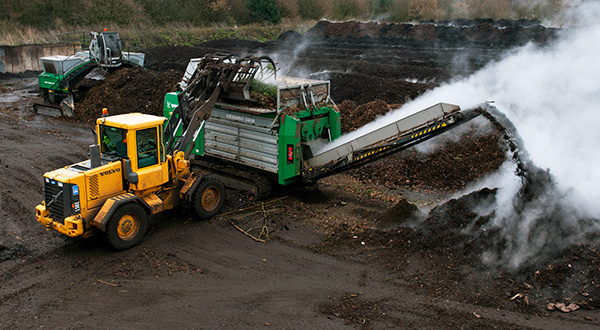 TMA Bark operates a successful open windrow composting process. our knowledge and high standard of processing puts our bark products in high demand nationwide. The raw greenwaste material is collected by TMA Bark Supplies from recycling centers. Material is also collected from households locally by way of local authorities general collection service. The material is brought to TMA Bark Supplies site, where it is weighed and tipped in the specified reception area. The raw material is then shredded into small pieces and put into what is known as a ‘windrow’. The windrow temperatures are constantly monitored over a 12 week period. High temperatures and moist conditions sustained during managed composting ensures that any plant and human pathogens are destroyed. The windrows are shifted with a specialised machine called a windrow turner. This allows the windrows to aerate as required. The windrows gradually move up the site where they reach the final stages of the process. Once a windrow has matured it is quality tested. It is then screened in several stages. The first stage of the screening process removes any plastics, metals and other contaminating materials using a specialised machine. The material is then safe to be screened into two product grades 0 – 10mm and 0-25mm. Once Screened the two product sizes are stockpiled ready to be loaded and delivered to our customers. This is the greenwaste recycling process complete! All of TMA Bark Supplies composted products are certified by NSF-CMI Ltd to PAS100:2011 and the Quality Compost Protocol 2007.